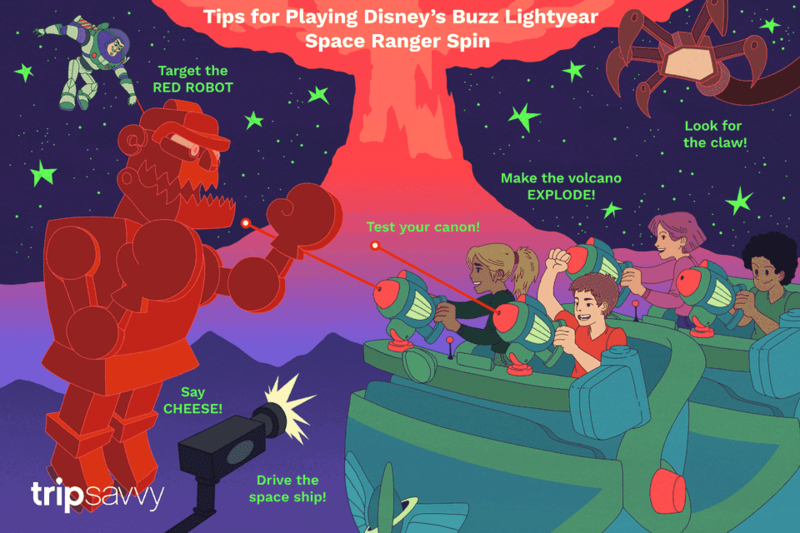 How to Improve your score on Disney's Buzz Lightyear Ride. Buzz Lightyear's Space Ranger Spin appeals to riders of all ages — even infants can ride with mom or dad. With designations ranging from the entry level "Space Cadet" all the way up to the chart-topping "Galactic Hero," there is a rank for every rider. While these tips may not get you all the way to the ultimate score (999,999 points), they will help you increase your personal best score considerably. Even hitting one of the "secret" targets revealed below can boost your score by up to 100,000 points. Drive the spaceship. Each space vehicle contains a pair of laser cannons and a single steering joystick. The person in charge of the joystick can position the spaceship to maximize their scoring potential. Check your laser cannon. When the ride begins, you will start in a dark room with plain black walls. Before you get to the shooting gallery portion of the ride, take a moment to fire at the black wall. you'll see a red dot from your cannon on the wall — note if the dot is a little above, a little to the right, or a little to the left of your laser gun site. This information will help you aim the cannon with more precision. Target the red robot: The first room contains an over-sized red robot moving both arms up and down. Aim for the interior of the arms — hit the target here and you'll rack up 100,000 points. The ride moves slowly enough that you may be able to hit this target several times before you pass. Make the volcano erupt: Look all the way past the moving aliens and target the volcano at the back of the next room — hitting the top target here will land you 25,000 points, and make the volcano erupt. Look to the claw: Like the three-eyed aliens, pay great attention to the red "claw" hanging overhead as you pass from room one to room two. You'll have to rotate the spaceship so you are traveling backwards to hit the target on the underside of the claw, but a hit on this tricky target will advance your score by 100,000 points. Aim for Zurg's ship: When you see Zurg in his orange spaceship, aim for the target at the bottom of the ship. This tricky shot will earn you 25,000 points, but you'll need to angle your spacecraft just right to take aim. Stay alert in hyperspace: The room with the flashing stars and speeding spaceships has only two good opportunities. Focus on the room exit, and look for the large spaceship. Aim for the round black dot on the body of the ship; hit this for an instant 100,000 points. Say "Cheese": The final rooms of Buzz Lightyear's Space Ranger Spin offer only minimal scoring opportunities, but be sure to smile for the camera when you see the flashing lights. You'll be able to spot your ride photo after you disembark. If you love Buzz Lightyear, don't miss our list of the best places in Disney World for Toy Story fans.